Daniel Crompton is the son of one of our clients here at Jones Harris. 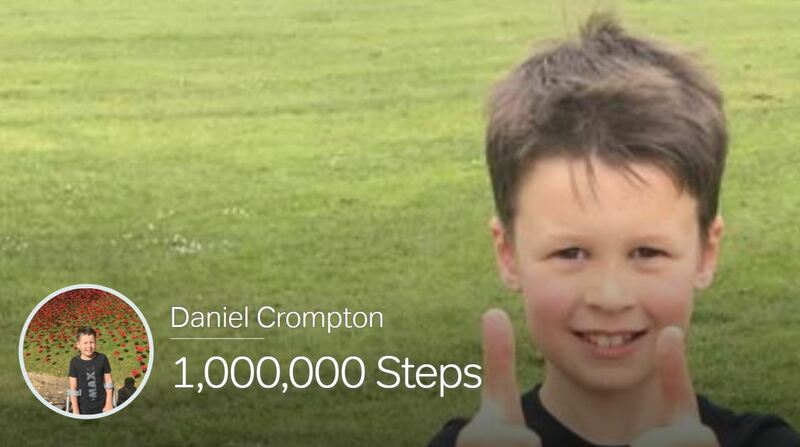 Aged just 9 years old, he’s turning an unpleasant health condition into a chance to do something marvellous for others by walking one million steps. Like most boys of his age, Dan enjoys playing sports, and of course sport can sometimes get a little rough and it’s not unusual for kids to get injuries. He wore a plaster cast for 3 weeks after a suspected fracture to his ankle, and everything was pretty typical up to that point for a 9 year old boy. However, when the cast came off Dan couldn’t walk and, unusually for someone under 10, he was diagnosed with Complex Regional Pain Syndrome, or CRPS. CRPS is a chronic condition which is thought to be caused by damage to the nervous system. It typically affects just one limb after an injury and flares up according to physical or emotional pain, and even the weather, so that some days it’s incredibly painful and others not so much. To make matters worse, Daniel’s grandad has been diagnosed with terminal prostate cancer. He’s decided to take on a challenge that would be difficult for most people, in order to raise funds and awareness for two charities which are close to his heart, Prostate Cancer UK and Burning Nights (a CRPS charity). Doing incredibly well under the circumstances, he’s almost reached 800,000 steps. Everyone at Jones Harris wishes Dan well, and hopes that he can complete his challenge as quickly and painlessly as possible. You can donate to 1,000,000 steps here, and spur him on to the end.